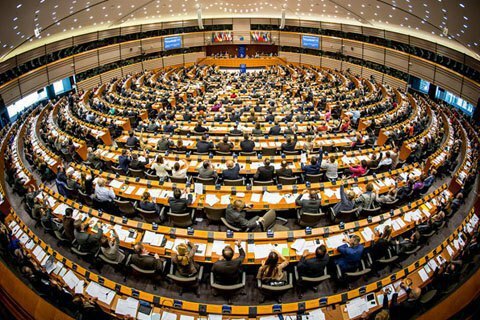 The European Parliament reiterated its concern at the involvement of European companies in the construction of the Kerch bridge. The European Parliament has called on the European Union to be ready to toughen sanctions against the Russian Federation if the situation in the Sea of Azov escalates. "The European Parliament calls on the VP/HR [the Vice-President of the Commission / High Representative of the Union for Foreign Affairs and Security Policy] furthermore to closely follow the developments, identify the chain of command, and prepare possible EU restrictive measures to be imposed in the event of an escalation," the European Parliament said in a resolution adopted in Strasbourg on 25 October 2018. "The European Parliament underlines that the Kerch bridge has been illegally constructed and welcomes the Council's decision to impose restrictive measures on six companies involved in the construction of the bridge," the document said. "The European Parliament calls on the VP/HR to follow more closely the evolving security situation in the Sea of Azov, which may have wider security policy implications affecting the EU and its Member States," it said. In addition, the European Parliament reiterates its concern at the involvement of European companies in the construction of the Kerch bridge, which, through this involvement, knowingly or unknowingly undermined the EU sanctions regime. "It calls in this regard on the Commission to provide clarification of the scope of the EU restrictive measures in force and on the Member States to share information regarding any national customs or criminal investigations into cases of potential violations," the resolution reads.